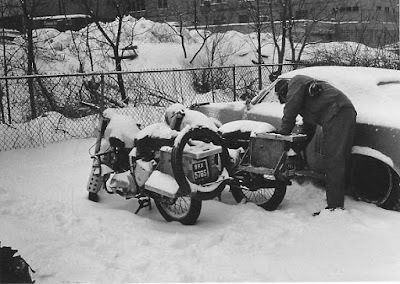 Royal Enfield Bullets covered with snow in Buffalo, N.Y., on the way to Toronto, Canada. Sampuran Singh, Subhash Sharma, Ashok Kher and Manmohan Singh set off from India to travel the world by Royal Enfield Bullet in 1971. They would cross places as challenging as the Sahara desert. Only two of them, Subhash Sharma and Manmohan Singh, would continue on across the Atlantic to the United States, Canada and Mexico but their travels here are just as impressive. Subhash Sharma recently offered to tell me the story. But where to begin? I commented that one of his photos shows the entrance to Meramec Caverns, a natural feature in Missouri I visited myself as a child. 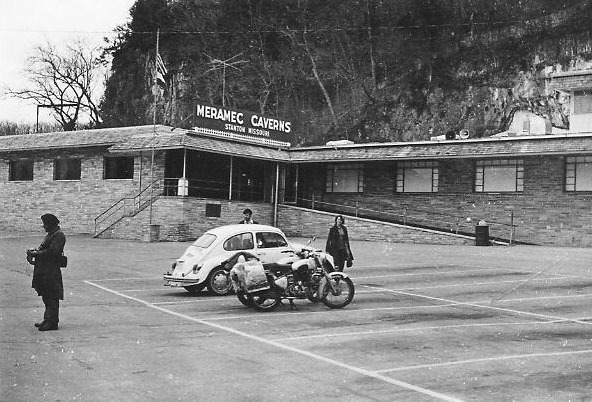 "I really cherish the memory of visiting Meramec Caverns in Missouri," Subhash replied. "I think it was the second week of March, 1972. We were driving down South when we saw the signs for the Caverns. We had no idea what the Caverns were all about. Royal Enfield Bullets at Meramec Caverns in Missouri. "It was close to 4 p.m. on a very cold and overcast day with some drizzling rain. On one side we wanted to keep driving so that we could find a place to stop for the evening and get out of the elements but on other hand we were really curious to see what that place was all about. "So we took the side road to the Caverns. You can see in the picture that we parked right in front of the entrance of the caves. I went there again about 10 years ago and I had to park a half mile away in the official parking lot." Their status as world travelers got them into the attraction free. But the story gets even better. "While taking the conducted tour of the caves we met a couple with their two children. They were very much interested in knowing more about our motorcycle trip and about us. To make the long story short, they invited us to their home, which was about 30 miles away in a small town. "We were glad that we did not have to find a place to spend the night. They were extremely friendly, generous and treated me as is if I was their family member. We had dinner with them, spent the night in their nice cozy home and next morning we had breakfast. "Just when we were about to leave the lady slipped an envelope into my hand saying that it was something little to cover the gas expense for next few miles. I stayed in touch with them for next few years but as time passed I lost contact with them. "That story is still so fresh in my mind that it is as if it happened just recently. There is lot more to this story but I will end it right here. 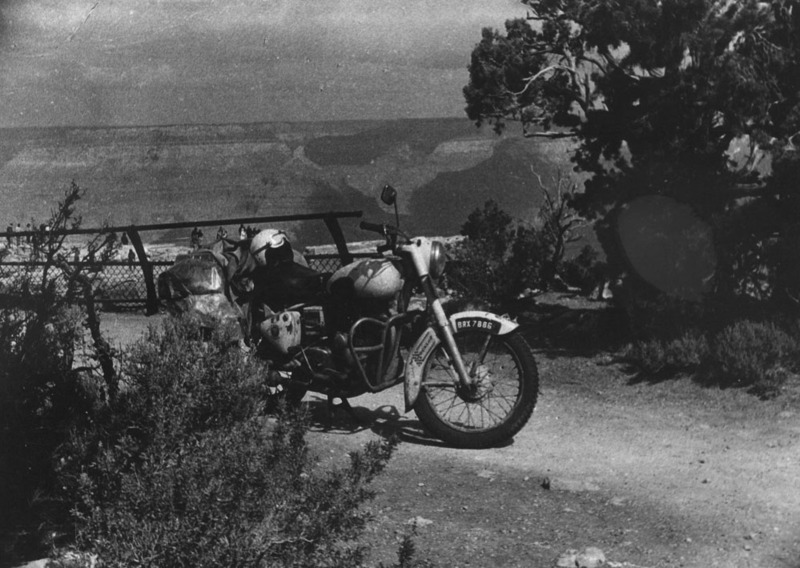 A rare sight in the United States: A Royal Enfield at Grand Canyon on a world tour in 1972. "There are so many stories that involve the curious and trusting nature of strangers and their generosity. "Just to give you some idea, we traveled for about two months in the U.S. With the exception of six days we never spent a night in the motels. It was always someone putting us up in their home or church. "There were many instances when strangers will pay for our meals without even telling us. Pay for the gas or never charging us for repair on the motorcycles, etc." 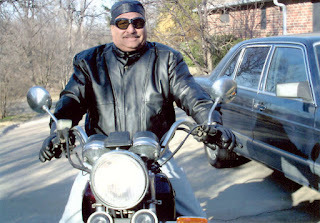 Subhash Sharma, in his driveway in Texas. As he told me the story I admit that I was delighted to hear that my fellow Americans had treated the young travelers from India well. It would be nice to think that things have not changed and they would be so well treated today. Manmohan Singh Bhuie died in October, 2015, Ahsok Kher a few years before. The Internet preserves the story of their world journey for the future. When Subhash Sharma contacted me to tell me about the story, my feeling was that I was honored to hear it. I hope that the retelling here may help preserve it. Great story. Enjoyed it all. 1972 as well! Just goes to show that bullets will plod on and on with easy maintenance.